The future will be bright in all those augmented realities. 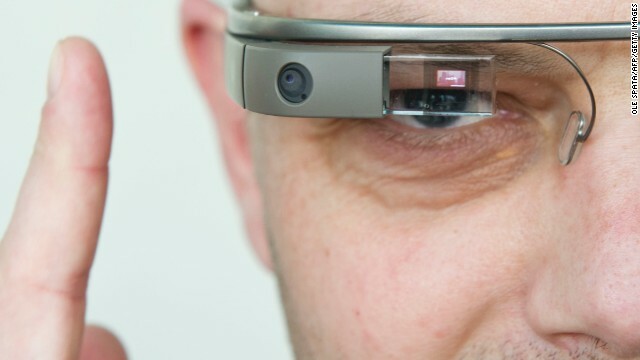 Google Glass is the wearable computer that responds to voice commands and displays information on a visual display. The dress that turns transparent when the wearer is aroused. Would you try it? Dutch design collective Studio Roosegaarde have developed a sensual dress called Intimacy 2.0 together with designer Anouk Wipprecht. Made of leather and smart e-foils, it 'explores the relationship between technology and intimacy'. The high-tech panels are stimulated by the heartbeat of the wearer. Initially opaque or white, they become increasingly transparent when exposed to an electric current -- in this case a beating heart. We might shout less at one another in the future, as it looks like we'll be wearing our hearts on our sleeves. Another garment that displays your emotions to the world is the GER Mood Sweater, by design lab Sensoree. Based on the technology of a classic lie detector test, it interprets emotions and displays mood instantly as an interactive light display. Blue means relaxed and red is nervous or angry. Rather than bringing dirt into your house, these shoes will clean it up. 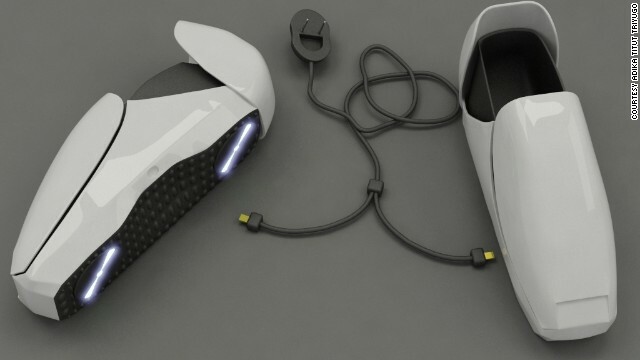 Looking like something out of Star Wars, the FOKI vacuum shoes are a concept from Indonesian product designer Adika Titut Triyugo. 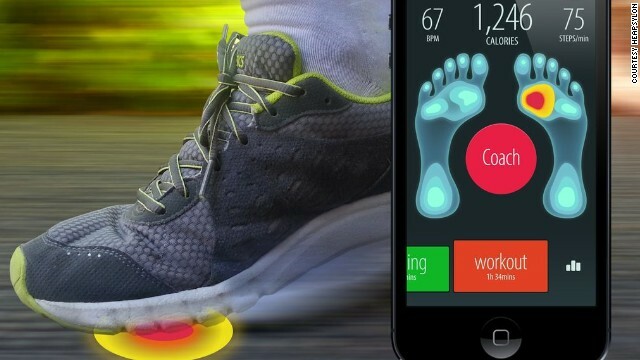 They are equipped with a pair of rotary cleaners on the sole of each shoe and a LED display on top that indicates battery life and cleaning progress. So be a trooper and go vacuum. It's a love/hate thing. The cycling helmet can save your life, but it doesn't look good and tends to ruin your hair. Thankfully the future offers a solution -- the Hövding. 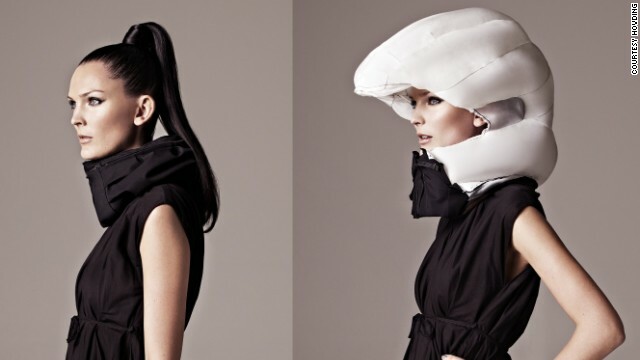 A Swedish creation, the Hövding is an "airbag for cyclists". It's worn as a collar and only expands into a full helmet if you have an accident. The future is all about leading a stress-free life and having all the solutions for all problems at hand. Literally. 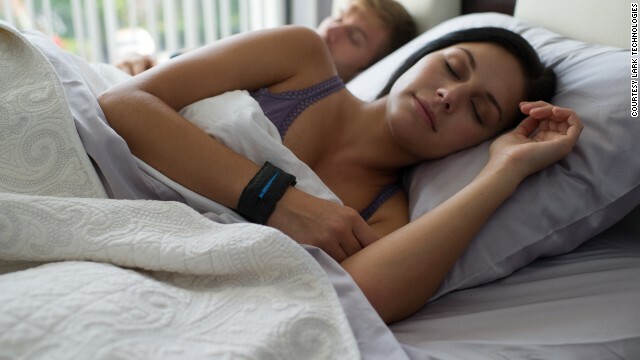 For example, if you wear Lark Pro's vibrating alarm bracelet, you can slip out of bed quietly without waking your partner. It's also designed to help insomniacs improve their sleeping patterns, by picking the optimal time in a sleep cycle to wake a user up. Don't like strangers approaching you? Then the Smoke Dress is a must-have. Designed by Anouk Wipprecht, the dress can suddenly visually obliterate itself through the emission of a cloud of smoke. Ambient clouds of smoke are created when the dress detects a visitor approaching, thus camouflaging itself within it's own materiality. Perfect if you are a fashionable socialite AND a misanthrope. Tired of waiting forever at a bar before you finally get your mojito? Tired of over-crowded bars even? Soon, your best cocktail dress will also make the cocktails. The DareDroid dress uses medical technology, customized hardware and mood analysis to provide you with your favorite poison. Designed by Anouk Wipprecht. One ring to rule them all! 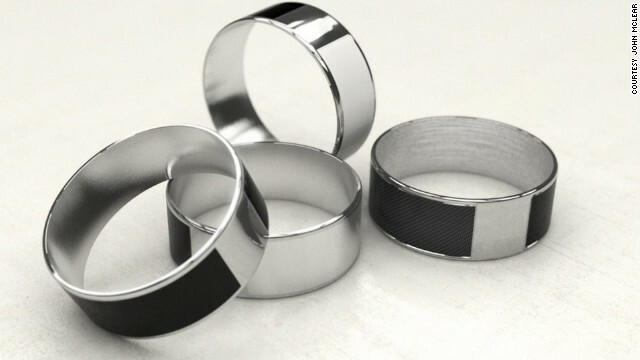 Use the NFC Ring, a UK-based Kickstarter project created by John McLear, to unlock doors, share pictures, share social network links, unlock phones and much more. Just fist-bump your phone or tablet or use an open-palm gesture to transfer the information. And it never needs charging. Booya! Shine bright like a diamond ... or be the star at futuristic rave parties. 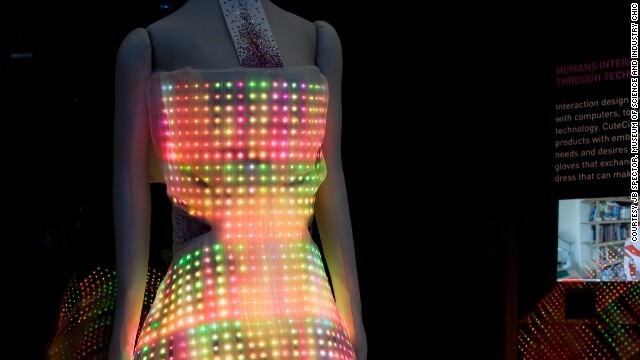 The GalaxyDress by CuteCircuit is embroidered with 24,000 full color LEDs, and is believed to be the largest wearable display in the world. The LEDs are extra-thin, flexible and hand embroidered on a layer of silk. Fabulous darling! Doing exercise without monitoring yourself be rare in the future of wearable technology. And wearing a giant watch that counts your steps is so 2012. That's where the Misfit Shine necklace comes in. It's a physical activity tracker that you can hang around your neck, or put wherever your want. The Shine's 12 dots represent your daily activity goal. Glow in the dark with the LumiDress. 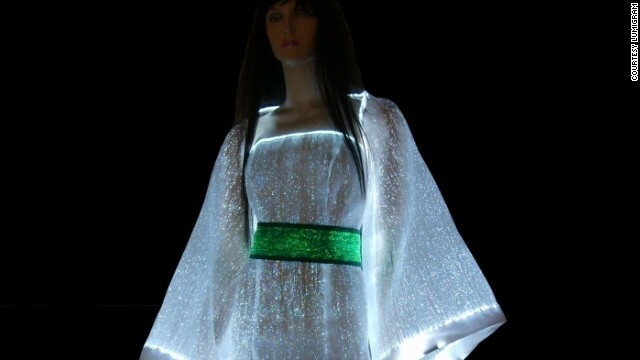 Made up of ultra-thin optical fibers woven together with other synthetic fiber this dress will light up the night. 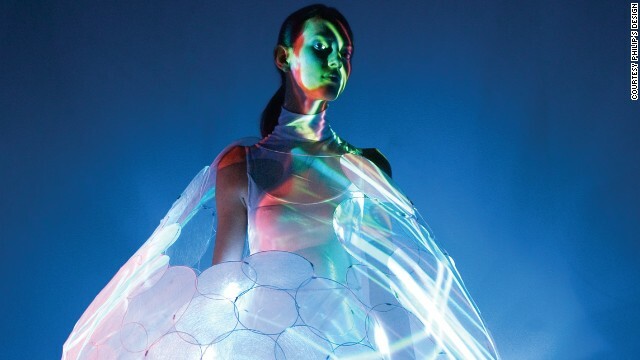 This concept dress called Bubelle by Philip's Design interacts with and predicts the wearer's emotional state by changing colors. A beautiful white can turn into a relaxed blue. Philip's dresses are made from high-tech materials and are still in the concept phase. In the future, your dress might advise you to skips that romantic walk through the fields. It might tell you that the area's greenhouse gas levels are too high. Danish design company Diffus has created the Climate Dress. It's laced with hundreds of small LEDs that will respond to greenhouse gases. They will pulse slowly when the levels are normal and flash rapidly in highly polluted areas. Thanks to all those gadgets you can attach to your body, there will soon be no excuse not to exercise. And to avoid injuries in the future where everyone will jog to work, Sensoria Socks by Heapsylon have come up with sensor-equipped textile that couples with an activity tracker to identify injury-prone running styles. Then, using a simple app, it coaches the runner to reduce those tendencies. 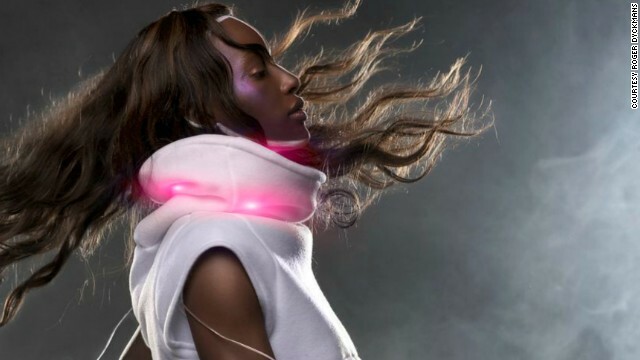 Editor's note: This week, two major conferences on wearable technology are taking place in the U.S. -- Wearable Technologies Conference in San Francisco and Wearable Tech Expo in New York City. CNN spoke to keynote speakers from both events to imagine how a day in the life of a wearable technology user might look in the year 2015. (CNN) -- 7:00am: You wake up to a gentle vibration on your arm, you look down and see your wrist-mounted Lark Pro alarm throbbing silently. It is 7 o'clock, Friday April 25, 2015 -- time to get up to go to work. Lark Pro is a vibrating alarm that allows people to slip out of bed quietly without waking their partner. It also helps optimize sleep patterns by waking you at the right moment in your sleep cycle. Sleep optimizing technologies are designed to help insomniacs improve their resting patterns by waking them during their lightest sleep phase. Monisha Perkash, a wearable technology inventor, says she uses her wrist alarm for this reason, to help "optimize my sleep schedule and track sleep patterns so you know you have the best night's rest." 7:10am: Before making breakfast you run your forearm across an ultraviolet reader on your wall to check your glucose levels. Your "nano-tattoo" shines back a reading that shows you are in the healthy blood-sugar range. As a diabetic, you used to have to prick your finger and take a blood sample to find out how your blood sugar was, but with the development of a nano-tattoo you now simply have to place your invisible tattoo under an ultraviolet reader. Heather Clark, inventor of nano-tattoos and an associate professor of pharmaceutical sciences in Northeastern University's Bouvé College of Health Sciences in Boston, explains that such technology "could be very user friendly, because once the sensor 'tattoo' was inserted, it would be easy and painless to take a reading using just light through the skin." Nano-tattoos are still a long way off but Clark estimates that, if they do become commercially available, they would be very cheap. 7:15am: Still half asleep you go downstairs to the kitchen and look through your cupboards for breakfast. Your Vuzix M100 assesses the nutritional value of each of the cereals on offer, and you finally decide on a mixed grain muesli, which you hope will set you up for the day with slow release energy. You eat your breakfast with a HAPIspoon, which monitors your food intake to ensure you don't eat too quickly. 7:30am: After breakfast, you go up to the bathroom to brush your teeth with a smart toothbrush, which assesses your brushing habits. Smart dental tools such as the Beam Brush send the results of your brushing directly to your smartphone. Tomorrow, you tell yourself, you will spend a few more minutes on your teeth and do a slightly better job. Sonny Vu, CEO of Misfit Wearables, says he is a committed Beam user, and that using a smart toothbrush "helps me keep my dental premiums down." 7:40am: You open your wardrobe to decide what to wear. You go past your Diffus UV dress, which measures how much sunlight you are exposed to, but as today is a cloudy day you aren't really worried about getting burnt. You also pass over your shark-proof wetsuit, which you wore on a recent holiday to the Great Barrier Reef in Australia. Finally, you settle on your Sensoree mood sweater, which, as you slip it over your head, emits a clear blue light to indicate that you are feeling calm and relaxed. In moments of stress the lights shifts to a vibrant mauve; when you are feeling angry it glows bright red. According to its creators, the mood sweater uses the same technology behind a classic lie detector test. Its sensors read your excitement levels and translate the data into a spectrum of colors. 8:30am: Before getting on to your bike for the ride to work, you put your protective Hovding hood around your neck, rather than a conventional helmet, because you don't want to mess up your hair. The Hovding is worn as a collar and only expands into a full helmet if you have an accident. 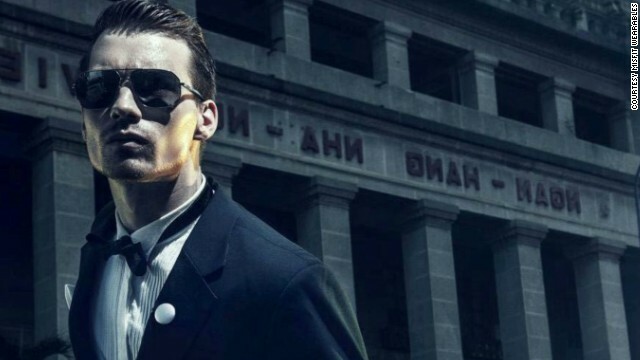 Syuzi Pakhchyan, a Fashion Technologist and wearable technology expert, says that "the beauty of the Hovding is that the technology is invisible. It simply disappears in the pleats of the decorative fabric shell, protecting the wearer by allowing the technology to get out of the way." 9am to 1pm: Throughout the day you connect to your Dekko-powered augmented reality device, which overlays your vision with a broad range of information and entertainment. While many of the products the US software company is proposing are currently still fairly conceptual, Dekko hopes to find ways to integrate an extra layer of visual information into every part of daily life. Dekko is one of the companies supplying software to Google Glass, the wearable computer that gives users information through a spectacle-like visual display. Matt Miesnieks, CEO of Dekko, says that he believes "the power of wearables comes from connecting our senses to sensors." Miesnieks says that in the future, software such as Dekko may allow people to "'see inside' buildings as we walk past them. Connecting online services and the real-time data about people and locations to our sense of sight ... We'll be able to look at something and get a search result back telling us all about it (who's in there right now? Is there inventory in-stock? What's the history of the place?)." 1pm: During your lunch break you go for a run wearing your latest high-tech sportswear. Designs such as miCoach training shirts, developed by US sportswear brand Adidas, track your performance and feed your results instantly to your smartphone. Qaizar Hassonjee, vice president of innovation at Adidas Wearable Sports Electronics, says: "in the near future, I see this combination of apparel and smartphones working together seamlessly and making wearable tech ubiquitous and part of our daily lives." Michael Durwin, a user experience consultant and Google Glass tester says that fitness has a large role to play in wearable technologies. "If I were an exercising type -- which I'm definitely not -- I'd use something like Nike+ to track my running in the morning. Or if I really wanted to monitor my health I'd wear a FitBit Flex throughout the day, checking it around 6pm to see if I've burned off enough calories to justify a slice of cheesecake." 6pm: After finishing up at work, you get back on your bike and ride home. Before you begin your ride, you tap on your Misfit Shine necklace. Before you start your ride, it displays 8 out of 12 dots, indicating that you are 65% of the way through your daily activity goal. After you arrive home you tap it again, and it shows 12 full dots -- you have reached your exercise target for the day. 6:30pm: When you arrive home, you quickly clean up your house with your Foki vacuum shoes, which gather dust as you walk. 7pm: You finish cleaning, jump in the shower and then change into your outfit for the evening. Tonight is not quite the right night for your Intimacy dress that goes transparent when you get excited. Instead you opt for your CuteCircuit K-Dress, which is powered by hundreds of LED lights embroidered onto a layer of fabric. Pakhchyan notes that "with illuminated fashion, there is a fine line between gimmick and innovation, (but) Cute Circuit's K-dress is sophisticated yet playful." Oh yeah, and a couple of hundred brightly flashing LED lights. See the full coverage of CNN's Blueprint -- a new series exploring the very latest design and technology trends. A baseball-sized shock absorbent camera that can be thrown into a disaster zone to assess risks posed to rescuers. Astronauts wash and drink from the same continuously recycled source for years. So why do we not do the same on Earth? A new strap-on external bicep called the Titan Arm allows humans to lift very heavy objects by giving them instant super strength. See the origami kayak take shape in our 40-second time lapse video. The 'Seaboard keyboard' is a tech forward interpretation of the piano, that reimagines what a keyboard can do. What if you could build your own smartphone that would last you for the rest of your life? Why did the Victoria and Albert Museum in London acquire two models of the world's first 3D-printed gun? It looks like a regular bike light, but one day Emily Brooke's Blaze light could save your life. After months of hype and speculation, the Samsung Galaxy Gear smart watch arrived this week with a bang... followed by a whimper. In 2050, when nine billion people are living on Earth, will high-protein insects be a part of our staple diet? He's invented breathable food, flavor clouds and olfactory telephones. Now David Edwards is bringing edible food-packaging to the table. Transparent dresses, vacuum shoes, shark-proof wetsuits and more. We imagine a day in the life of a wearable technology user in the year 2015. Europe spends $13 billion annually on fueling street lights. With a new system called 'Tvilight', streetlamps can sense the arrival of a person.